The Bible treats beauty as something that has valuable because God made it and delights in it. We should do no less. Our custom stained glass studio has a special affinity for church projects and has developed expertise an excellent reputation for our work in this area. Our mission is to assist churches attain a higher level of worship, witness and spiritual growth by integrating faith and art through our creation, maintenance and restoration of stained glass. The excellent of all our stained glass services enable your church to be a good steward while having the kind of glass that will most effectively support its other ministry efforts to glorify God, to proclaim His Gospel and to inspire members. We believe when pursued with an awareness of God as the source and end of all creativity, beauty and truth, stained glass becomes a means of Christian growth and praise. Ideas by which people live have always been expressed in images, symbols, stories and characters. These are all things that stained glass can portray. Beauty needs no justification for existence. Stained glass is a powerful tool for proclaiming truth. It is an effective tool for inspiring worship, facilitating teaching, reminding and commemorating. This is true whether the church architecture is classic or modern and whether the worship style is traditional or contemporary. Ecclesiastical glass should definitely have a place in your church. In order to create God honoring windows we will be guided by your needs, tastes, prominent beliefs, liturgical traditions, worship style, architectural motif, budget, schedule and other pertinent objectives. This collaborative effort assures you of a smoothly conducted project as well as a successful conclusion. The result will be windows which are sound in theology, art and construction. Help your loved one's testimony live on. A memorial window is a great way to honor God and to remember a loved one. Usually funded entirely with gifts, memorial windows provide a tangible, beautiful and suitable means by which loved ones can be honored. Memorial windows are also an excellent means for acquiring stained glass for your church. We can help donors and your church develop an appropriated theme or design for their particular window. In addition, we can work with your church to plan a coordinated, comprehensive program of designs for future memorial windows. The existence of such a program will stimulate gifts to support your stained glass program in the future. It will also provide the most effective and attractive overall final results for windows acquired over a period of time. 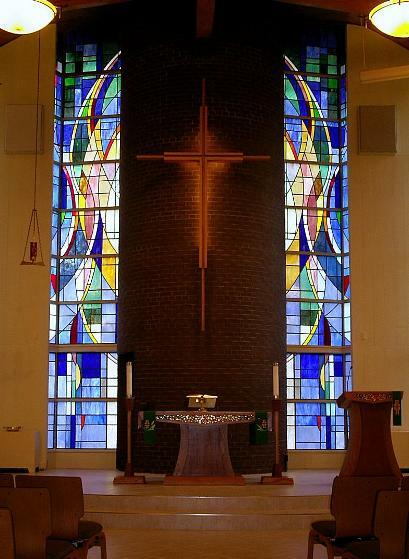 Even without religious symbolism stained glass can advance worship by providing privacy, establishing a mood, blocking a distracting view and controlling light and glare. It can play an important role in enhancing your worship by creating a sense of special place and time. It provides a physical and emotional stimulation of joy and wonder that comes from light and color. Stained glass is also important in defining the architectural style of your building. We can adapt stained glass you now have to a new location, size or use. Increasingly churches have stained glass from a previous building or another congregation they would like to adapt for a new purpose. However, the new application for this glass is rarely the same as it originally was. For instance, borders may need to be expanded, previous poor repairs corrected and missing panels duplicated. We are able and willing to work with these older windows and are experienced in successfully adapting them for continuing inspiration and service. Let us repurpose them for you.